Magic the Gathering has some really exciting upcoming releases. 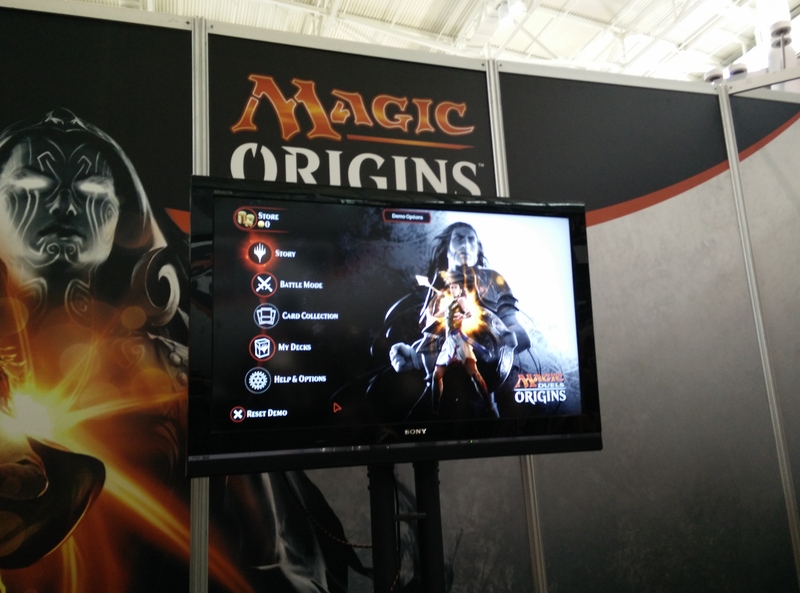 During PAX I got a chance to see stuff from the upcoming Dragons of Tarkir and Origins sets, as well as get a hands on look at Magic Duels: Origins. Let’s start with the latter, shall we? 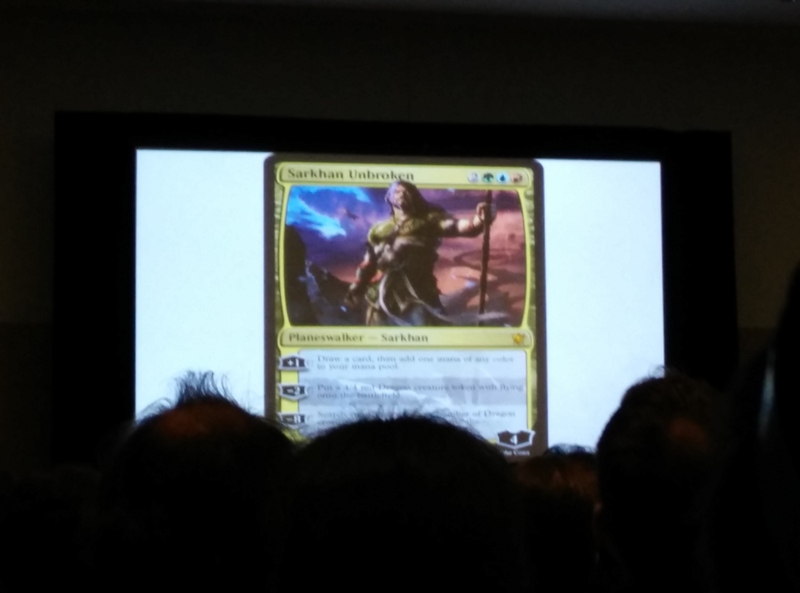 Magic Duels is replacing Duels of the Planeswalkers as the digital format for Magic play. The game will be free to play with additional sets, challenges, etc… unlockable via in-game coins. Coins can be purchased, or can be earned through play. I was assured that all in-game content can be unlocked without spending a single real-world dollar. Magic Duels is also moving away from the yearly release schedule that Duels of the Planeswalkers used. It will be a game client that is constantly updated with sets available for purchase. This will eliminate the issue of buying expansions for a previous version of the game that don’t carry over to the next year’s version. The first set that will come with Duels will be the Origins set, with Blood, a Tarkir-themed set, being released shortly after. This is why we haven’t seen any Tarkir cards in Duels of the Planeswalkers 2015. The Origins set will have campaigns for each of the five main Planeswalkers, chronicles their journeys from a mage into the Planeswalkers we know and love today. I got a chance to play a bit of the first campaign, and the gameplay is smooth as expected. Also a welcome addition, the timer has been sped up a bit keeping the game moving at a much faster pace than before. Did I mention they’re bringing Two Headed Giant mode back? Oh yeah, they are. I’m more excited about Dragons of Tarkir than I’ve been about a Magic set in a long time. The set, as expected, is chock full of dragons. The story has Sarkhan ressurecting dragons in past, changing the history of Tarkir. The Khans never rose to power, and instead the clans are now led by might dragons. The legendary dragons are amazing, each sharing the characteristics of the clans we’re familiar with from the previous sets. Sarkhan has also become much more awesome. I’m sorry for the blurry pic, but I wasn’t that close to the screen here. The biggest thing here is his -8 power, which is blocked by the lovely people’s heads here. It allows you to take any number of dragons from your deck and place them directly on the battlefield. For free. Take a second to digest that. I need this card. Up until now we’ve had sets that frame out a world and the events that take place in that world. Origins changes that a bit, focusing on the more personal lives of the Planeswalkers. To do this, we’re going to see some new dual-sided cards in the game. The interesting part about these is that the first side is a normal character that you would summon into the battlefield. Once certain conditions are met, the card flips to reveal a Planeswalker. For example: Liliana Vess was a healer before her spark. You can summon her, and she has the ability to bring back a dead creature as a zombie. When you do this she’s exiled from play. You can bring her back as Liliana Vess as we know her, a Planeswalker Necromancer. It’s really cool how it works.